We’ve been waiting months for a consultant report on the Center City Streetcar project, since Mayor Durkan put it “on hold” pending financial review earlier this year. But the end of June deadline for that report has come and gone. In the meantime, Durkan let slip a detail in a KUOW interview that has snowballed into speculation about how badly the project has gone off the rails — even in the face of strong political support to see the project through to completion. While we are awaiting the results of the independent review of the Center City Streetcar ordered by the Mayor a media report noted that the new streetcars as designed won’t fit in the existing maintenance barns, and that there may be an issue of whether they fit the gauge of rail. Council Central Staff, on my request, has verified the accuracy of this report; it appears the error will require either a change order for the design of the streetcars or incur new costs for construction of new or retrofitted maintenance barns. I am requesting that the Mayor’s Streetcar Assessment include full transparency in the added costs for this unfortunate error. It’s disappointing to hear this—these issues of accountability need to be dealt with much earlier, and they highlight the need for the increased Capital Project Oversight the Council has been working on. There needs to be an updated assessment of the O&M costs for the existing SLU and First Hill streetcar lines. In August, it is hoped that KPMG will finalize their report to provide their independent analysis of the project. The KPMG analysis was much more complex than initially expected – including the review of thousands of estimates, design materials and correspondence. The report will provide a fact-based review of costs, ridership, opportunities and challenges with building and operating the C3 streetcar. What are the capital costs of building the C3 streetcar? What are the capital costs of utility relocations? What are the costs of delaying construction until future years? What are current and forecasted O&M costs of the SLU, First Hill and C3 streetcar lines? What are the current ridership numbers and future ridership assumptions on the current lines as well as C3? Given actual and projected ridership and farebox collections, and projected O&M costs, will there likely be ongoing budget shortfalls and if so, how much? What are the ongoing O&M subsidies from partner agencies and businesses? Are there ways to reduce O&M costs while optimizing ridership on the C3 line? What are the long-term financial projections, including subsidies, for the streetcar? If O&M subsidies decrease or cease, what are the expected budget implications for current lines as well as the C3 line? We are hopeful that the KPMG report will address nearly all of these questions. How does the increased weight of the new cars impact the current system? Can the full streetcar route handle the additional weight of the cars? How does the length of the new cars interact with the current system? How does the width and length of the new cars impact the maintenance barn? Does the width of the new cars impact the current system? How does the size of the cars impact the design of the proposed stations as well as current stations? There’s a lot of talking in this series of events, but little actual information, a fair amount of speculation, and an abundance of questions. Let’s unpack it a bit, starting with the gauge of the track. Railroad track gauge (the width between the tracks) is a well-known and well-established standard in the United States, 1.435 meters, dating back nearly 200 years to the United Kingdom. The Seattle Times provided a link to the specifications document for the new streetcars. 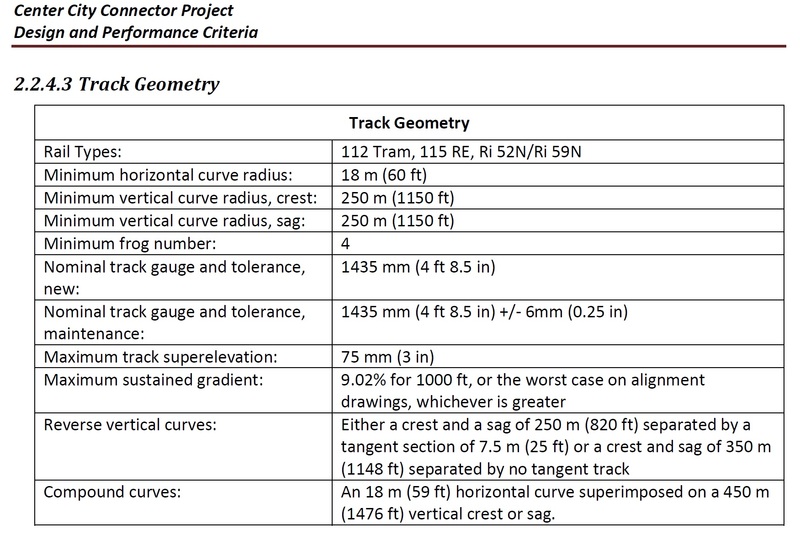 The document shows that the track gauge for the streetcars was written to the official standard. So if the cars are manufactured to a different gauge — which would be stunning given the wide application of the standard — that would be a manufacturing error, not the city’s mistake. That said, the spec also allows the new streetcars to be longer and wider than the ones currently in use on the First Hill and SLU lines, as well as heavier. It also precisely specifies the “platform interface,” the exact distance from the center-line of the cars to the platform edge as well as the height of the platform at the doors, which is required to ensure that the cars align properly with platforms. That needs to be the same as the existing cars. The track gauge shouldn’t be an issue. It may be that the tracks already installed on the First Hill and SLU lines may not be strong enough to support heavier cars, but that’s a very different question. And there’s some precedent for that: when the bus tunnel was originally built, they used the wrong tracks and later needed to tear them up and replace them when Sound Transit was ready to start running trains through the tunnel. The update from Durkan’s office yesterday specifically asks whether the First Hill and SLU lines can support the weight of heavier cars. It may be that the Mayor misspoke in her KUOW interview when she said that the track gauge was an issue, and conflated the width of the cars with the width of the track. Her statement yesterday reiterates that the new streetcars are heavier, longer and wider, but doesn’t reach any conclusions about incompatibility with the track gauge (though it asks the question again). However, there have been several recent mentions, including in Durkan’s statement, that longer and wider cars might not fit into the existing maintenance barn. If they don’t fit, it’s an issue, but not an unsolvable one. A much more serious issue would be if longer and wider cars don’t fit with the existing platforms and along the path of the existing lines — and Durkan’s statement suggests they are looking at that was well. 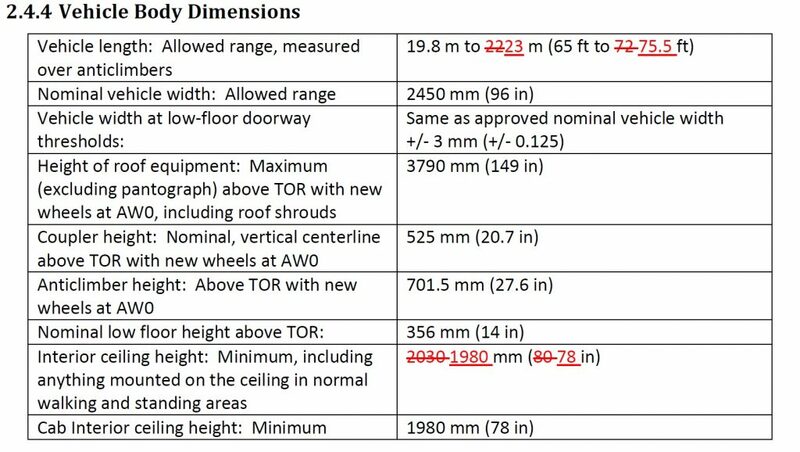 However, the specifications document says that the platforms are 1.280 meters from the track centerline and the maximum vehicle width is 2.450 meters, which would make it 1.225 meters from the centerline — so as long as it’s built to specification, the platforms shouldn’t be an issue either. These are very technical questions, but ones that can be answered and verified with great precision by engineers such as the ones KPMG is using to conduct its review. A constant trickle of incomplete information makes for some good headlines, but doesn’t lead to good decision-making about the future of the project, so as frustrating as it is to wait for a delayed report before reaching conclusions as to what should happen with the project, that’s the best course of action. Nevertheless, a group of businesses calling themselves the Seattle Streetcar Coalition sent the Mayor a letter last month urging the Mayor to let the project go forward, while The Urbanist speculates on what the report says, claims that the Mayor has refused to meet with the group, and accuses her of an anti-transit bias. To ensure full transparency and accountability in this project, the City will be releasing the KPMG report to the public once finalized. The Mayor has heard a range of opinions and questions on the project including from many businesses in downtown Seattle. She wants to continue to hear from the public and stakeholders as the KPMG report and engineering updates are released, so all stakeholders have the full details and facts regarding the project. No final decision will be made until budget, feasibility, and community impacts are understood. They hope the KPMG report will be finished next month. Stay tuned, and try to reserve judgment until we have better, and more complete, information. At that point, it should become clear whether the Mayor was justified in delaying the project to conduct a review, and it should be easier to evaluate the options on how to move forward, incorporating technical, financial, transportation, political, economic and community considerations. The issue with the tracks in the DSTT was that they were not grounded for use with electric trains. Also, ADA standards regarding platforms had changed in the intervening years. In addition, the Low-Floor Light Rail car was not a reality in North America when the DSTT was being designed and built. For example, San Diego has also had to revamp their Light Rail stations due to these changes in standards and available train cars. Right. My point wasn’t specifically the weight issue, it was simply that there was precedent for having to rip up and redo tracks. Thank you, Kevin, for doing what our lazy, uninquisitive news media did not do–putting the wrong gauge worry to rest. Any Engineering Aide at SDOT should have been able to do the same in 10 minutes, and there must be 50 employees at SDOT that have been quietly seething all this week, not being allowed to speak to the media to tell them that there’s no fit problem, except possibly in the maintenance shed. Instead, #MayorJenny is paying unknown tens or hundreds thousands of dollars to a financial consulting firm that is spending 4 months doing the same. Why can’t even SDOT interim head Sparrman have come out via his paid spokespeople and denied that there was a wrong gauge problem? I take exception with your description of our local news media: they are neither lazy nor uninquisitive. They are hard-working, overworked, and understaffed. One consequence of understaffing is that they have a difficult time hiring people with deeper backgrounds in particular areas, like transportation, engineering and finance. That means reporters — myself included — often don’t know what questions to ask and which assertions are implausible and deserve further digging. The Mayor also is not an expert on transportation, engineering and finance, and is reliant on city staff (most of which she inherited from Murray) to advise her. In this case, she said that she wanted an outside review by financial experts, and then added an engineering review when issues came to the surface. That is a big vote of no confidence in SDOT leadership. We can assume that the Mayor has seen a lot more information than has been made public to-date. The operative question is whether the Mayor has enough information to make an informed decision as to whether to continue with the project under the current plan. she clearly didn’t think that she did, though others disagree. We will need to wait until the KPMG report is released to answer that question — whether the delay and outside review was warranted and provided new, relevant information. We will have to disagree about the local news media. There was no excuse for a dozen stories in newspapers, TV & radio station websites, local blogs, and a city councilmember, all repeating the possibility of “wrong gauge,” when a smart person like yourself was able to take a look at the bid specifications and put it to rest. While I agree that MayorJenny wanted KPMG to review many things about this project other than the rail gauge, her own staff put out a release repeating the “wrong gauge” worry, and, as you wrote, unless there is or will be some sort of very unlikely manufacturing error, the gauge should not be a problem. Yes, this is indicative of no confidence in SDOT on the part of the mayor and she must have told Sparrman not to say anything about this, because any department head with the normal amount of pride would have been quick to deny that there was a gauge problem . . . or did he not even know that this issue was circulating? I expect that there will be further stories to come repeating the “wrong gauge” thing.